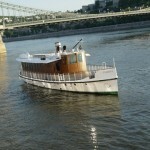 Pannonia ship is a beautifully restored nostalgia boat often hired for smaller private cruises, for business, wedding and pleasure cruises in Budapest. 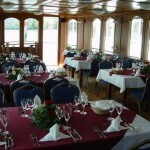 Pannonia ship is one of the most beautiful smaller ships in the cruise fleet, a gem of the Danube in Hungary. 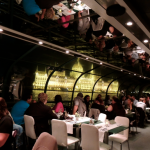 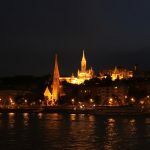 As the ship was built in 1927, and has been recently restored with meticulous details, aiming to keep its almost 100 year old structure and design, the ship has a slow motion, with the sounds of the nostalgia Diesel engine huffing and puffing along the river Danube. 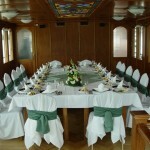 The decks are covered in beautiful and aged wooden panels. 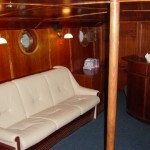 Stained glass ceiling makes the interior of the historical boat even prettier and more unique. 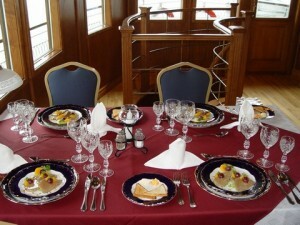 The beautiful table setting is enhanced by the fine crystal glasses recalling the age of the 1920s in Austro – Hungary. 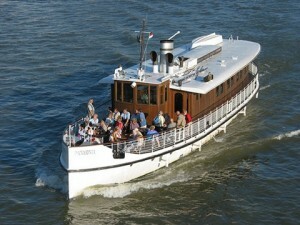 You can hire the boat for a group of 10 – 45 people, depending on what sort of program you are planning on the boat. 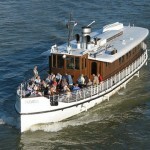 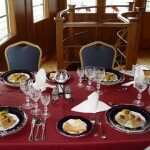 For a seated event, the max capacity of the boat is 36 people (6-6 guests at 6 tables). 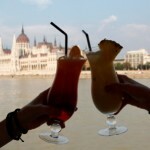 thank you for contacting us for a Budapest cruise offer. 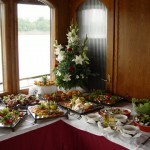 We have sent you an email with the details to you email address Reservations@A … el.com. 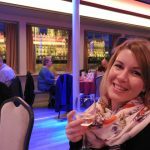 I would like to book a table for two for dinner tomorrow, the 31st of May 2018, please.